Whenever I go by the train, I tend to listen to a lot of instructions from my parents. ” Do not eat biscuits given by Strangers ” This dialogue is so cliched that we start thinking no other food can be used to put us to sleep other than the biscuits. Even after all these days when some one opens a pack of Biscuits, I do not maintain eye contact at all. Sometimes I even pretend to sleep avoiding the impending danger. The best thing about any place on earth is the Food that is available there. Trains are totally the mobile restaurants. The way in which the vendors calls the product urges you to buy one. This is something that has to be a case study in B – Schools. For example when a vendor sells Soup he goes like ” Soup Soup Souppeee . Tomato Soup Soup Souppeee”. Sometimes I feel the vendors have more money in their pockets than my dad. Sometimes the pattern gets a little disoriented. Sometimes the Ice cream guy comes first and then the Bread Omelette guy and then the soup guy. But Southern Railways offers you a lot of options to choose from. The best part is when the train is moving, they sell food inside and when the train stops they sell food outside. You are literally surrounded by people and food. When i travel by the night, there will be always someone in the coupe who will keep the light on troubling everyone. I remember my fear that the bolts that hold my berth might unlock by itself and I will sleep peacefully only after my dad assures me that it is perfectly fit and it won’t get unlocked. I will wake up to find that my arm is holding the belt though. That’s when people start walking around in their pajamas brushing their teeth like its their balcony. 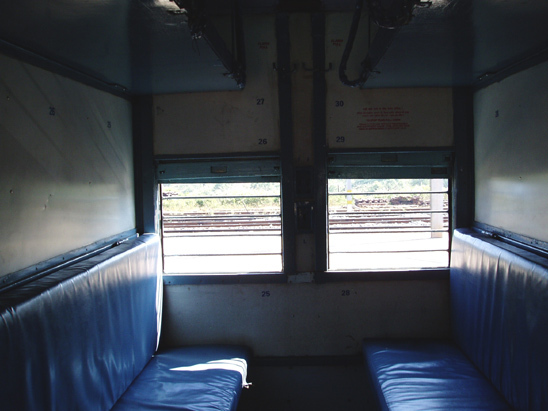 Trains stand as a testimony for what India is called – Unity in Diversity. You will find different kinds of people eating, talking and sleeping in one place. Nothing beats the joy of reading a Tinkle in the Train.But somehow when i come back home, the Tinkle goes missing. There is a connection between Tinkle and Trains. I especially love the part when the book vendors leave a set of books and take it back later. For a brief period of time you can hold the books, count them, count them again, smell them, see pictures and select one or two if your dad is still not annoyed at your behaviour. I just wish that some of these things don’t change as my kids should also experience these little things that make train journeys more than just memorable.